AUGUSTA, Ga. (Oct. 2, 2018) – A member of a protein family known for protecting our cells also protects cancer cells in aggressive, metastatic breast cancer, scientists report. Induction of heat shock protein 70, or HSP70, – which protects cells from stress – appears to be a key difference between difficult-to-treat triple negative breast cancer and the more responsive estrogen-positive breast cancer, says Dr. Hasan Korkaya, tumor biologist at the Georgia Cancer Center and Department of Biochemistry and Molecular Biology at the Medical College of Georgia at Augusta University. "This aggressive breast cancer hijacks your normal protective physiological process to survive the toxic environment it has created," says Korkaya. The finding illustrates at least one way tumor necrosis factor alpha, or TNFα – which as its name implies can cause cancer cells to self-destruct – is manipulated by cancer to instead aid its survival. 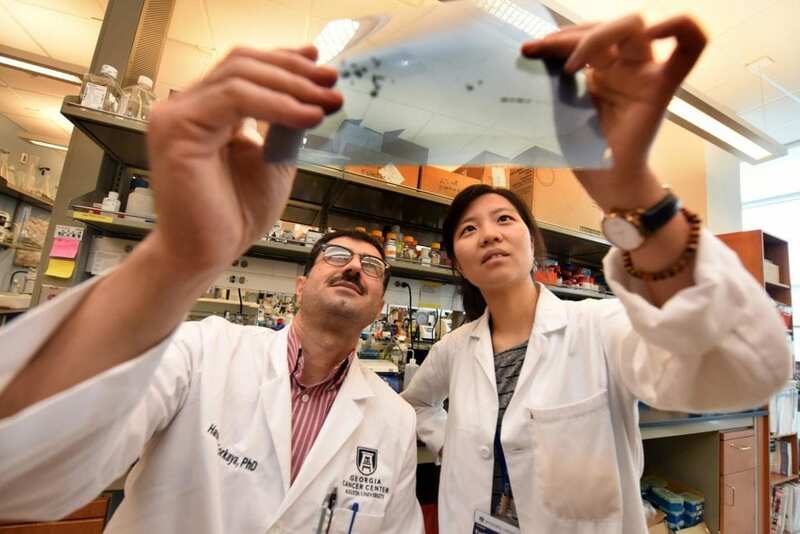 "Here we show that TNFα supports aggressive breast cancer by first upregulating A20, which induces HSP70, which protects cancer cells from TNFα-induced apoptosis," says first author Eunmi Lee, a PhD student in biochemistry and cancer biology in The Graduate School at AU working in Korkaya's lab. It also provides evidence that targeting HSP70 could be an effective strategy for some of the most aggressive breast cancers, they report in the journal Oncogene. The scientists, working in animal models and human breast cancer cell lines, already have started using HSP70 inhibitors, looking both at efficacy and toxicity, before also giving more TNFα, which should then be free to kill rather than protect cancer. They've found that to aid cancer, TNFα first induces the protein A20, which in turn induces HSP70. A20 is a failsafe mechanism immune cells use after aggressively attacking an invader, like a bacterium, to stop expressing things like cytokines used to kill the invader so they do not instead begin attacking the body. In fact, for autoimmune diseases like lupus and rheumatoid arthritis, where the immune system is attacking the body, a major treatment is TNFα blockers, Korkaya notes. A20 has not been linked to HSP70 in immune cells, but the new work indicates a powerful partnership in aggressive breast cancer cells that essentially shuts off cell death. "We think A20 determines TNFα activity in different tumor types," Korkaya says. "The cancer cell cannot induce apoptosis, it cannot die." To make matters worse, the partnership also promotes a cancer stem cell type that makes the durable cells more aggressive and able to spread. "Not only are the breast cancer cells protected, they become more aggressive," Korkaya says. They are still investigating why TNFα induces A20 in this scenario. He notes that constant upregulation of HSP70 by A20 is important to cancer, because the heat shock protein is so rapidly degraded. In less-aggressive luminal breast cancer, TNFα doesn't upregulate A20, rather helps cancer cells commit suicide, they report. But when the scientists overexpressed A20 in these luminal breast cancer cells, they started functioning more like their aggressive counterparts. When they inhibited A20 expression, then gave more TNFα to the aggressive cells, the previously diligent cancer cells started dying off. But when they gave TNFα without first inhibiting A20, the cancer cells produced even more of the protective protein. Why TNFα doesn't upregulate A20 and HSP70 in luminal breast cancer is another question they want to answer. They also want to look at whether A20 is upregulated in patients whose disease has progressed, and suspect they will find it is. Study coauthor Dr. Jason E. Gestwicki, professor in the Institute for Neurodegenerative Diseases at the University of California, San Francisco, provided an HSP70 inhibitor he developed for the studies. Breast cancer is the second leading cause of cancer death among women, just behind lung cancer, according to the American Cancer Society. Triple negative breast cancer accounts for about 15-20 percent of breast cancer cases, according to the Susan G. Komen® organization, and is typically treated with a combination of surgery, chemotherapy and radiation therapy. Autoimmune diseases like lupus are known to have gene mutations in the multifunctional A20. Mice missing A20 experience multi-organ inflammation and death, but its usual skill at activating inflammation has been shown to promote regeneration of the liver. HSP70 is found in high levels in a lot of tumor types and those high levels typically correlate with metastasis and a poor prognosis. HSP70 inhibitors already are in clinical trials for cancers like non-small cell lung cancer. Many of our cell types use one or more of the heat shock proteins to protect themselves from extremes like cold, heat and too little oxygen. Their diverse functions include aiding the proper folding of proteins, the workhorse of cells, so the protein performs the proper job. Misfolding, for example, can result in a variety of conditions from Alzheimer's to cancer. Cancer cells use heat shock proteins to enable their successful growth and spread and even to help them become treatment resistant. The research was supported by the Susan G. Komen® organization and the American Cancer Society. View the published study here https://www.nature.com/articles/s41388-018-0472-0.epdf?author_access_token=aJ84BYkPB8cyQZqJjsfGA9RgN0jAjWel9jnR3ZoTv0MaM94Eu13Ku946IZHTweRhGDeuOdWSkmmdJZ88Ws_zFDghHxQaZMGhHqvQ6DEV9d2pBxlMTNT3yG3yQaCKoi17NRVAdK5N8wYZUV-89EkSew%3D%3D.